Like countless others of their generation, many post-war American Jews have abandoned the religion of their birth to search for a spiritual home in other traditions. Some find their way back to the faith of their heritage, but why do so many find that the synagogue has not met their needs? 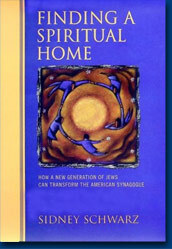 In this illuminating look at Judaism’s future, Rabbi Sidney Schwarz offers a penetrating analysis of the American Jewish community, challenging American synagogues to respond to a generation of seekers and satisfy the spiritual hunger of the “new American Jew.” This groundbreaking book not only reveals the possibilities of this new, vital spiritual culture, but also offers strategies for transforming any congregation into a place that the Jews of today can truly call home. Arguing for the creation of a new model-the synagogue community-Schwarz profiles four innovative synagogues (one from each of the major movements in American Judaism) that have had extraordinary success with this new approach to congregational life. Schwarz presents ways to replicate their success and transform our understanding of the synagogue and its potential for American Jews. Highlighting specific strategies to transform existing congregations or to create new ones, Finding a Spiritual Home is an eloquent and powerful call to spiritual seekers to explore the riches of the Jewish tradition. With compelling accounts of Jews who “came home” to Judaism, this book conveys a message of hope for every Jew who is longing for connection, transcendence, and purpose in Judaism-every Jew who seeks a spiritual home. An added bonus in the book is a discussion guide for book clubs and study groups. Purchase Finding a Spiritual Home. The newest calling of the American Jewish community–transforming the synagogue into a “spiritual home”–finds its voice in Schwarz’s profile of four model congregations, one from each Jewish denomination. Schwarz, a Reconstructionist rabbi and founder of the Washington Institute for Jewish Leadership and Values, argues that the suburban, child-centered, service-oriented “synagogue-center” of today is in crisis, unable to provide the connectedness, belonging, intimacy and inclusiveness many baby boomers are seeking. Instead, he proposes, congregations should become participatory and welcoming “synagogue-communities,” as exemplified by Beth El Congregation in Sudbury, Mass. (Reform); Hebrew Institute of Riverdale in New York City (Orthodox); Adat Shalom in Washington, D.C., which he founded (Reconstructionist); and B’nai Jeshurun in Manhattan (Conservative). Ten powerful “spiritual autobiographies” of individual members punctuate Schwarz’s congregational profiles, highlighting his thesis that sharing personal journeys can be the most compelling aspect of community. While Schwarz admits that these synagogues are atypical, guided by empowering and charismatic rabbis who built their congregations from the ground up, he hardly touches on other transformation projects that have sprung up across the country. His 10 strategies for transformation should provide first steps for those willing to commit their energies to reinvigorating synagogue life. – Reed Business Information, Inc. The hunger for a spiritual life has led to a boom in all kinds of trendy movements that call for little commitment, a phenomenon as evident in Judaism as it is in the general population. This study portrays the spiritual odysseys of people who are seeking something deeper. Rabbi Schwarz, a spiritual activist, has identified one synagogue within each of the main streams of American Judaism–Orthodox, Conservative, Reform, and Reconstructionist–headed by a deeply committed rabbi who is as active communally as spiritually. The people profiled responded to the spirituality and the intellectual and communal activity and in turn contribute so that their communities are greatly enriched. For instance, the Hebrew Institute of Riverdale (Orthodox) has a thriving youth program that pairs observant and nonobservant youths in prayer and study in a big brother/sister program. The observant youth mentors the novice, and both experience intellectual and spiritual growth. Many of these young people take on leadership roles in the community as they mature. Each story is interesting, well told, and meaningful and can chart a path for those seeking similar religious commitment. Recommended for larger public libraries or where there is a significant Jewish population. Finding a Spiritual Home promises to explain “how a new generation of Jews can transform the American synagogue.” The book delivers on this promise by describing the lives of four thriving synagogues whose theological orientations range from Reform to Orthodox. Undoubtedly, Finding a Spiritual Home addresses some burning questions about the future of American Judaism: fully 35 percent of ethnic Jews no longer identify themselves with Judaism, author Sidney Schwarz writes. The book begins with a historical overview of synagogue life in America, then describes the spiritual needs that various generations of American Jews presently experience, and finally offers a prescription for regeneration of synagogue life. Throughout the book, Schwarz’s arguments expertly interweave narratives of individual and communal religious life, taken from the four synagogues in whose innovations Schwarz finds hope for American Judaism. These religious communities have attracted large numbers of worshipers with programs that seem both radical and commonsensical–“establishing public service opportunities such as a Jewish version of Habitat for Humanity,” for instance, or encouraging worshipers to write their own prayer books. Schwarz carefully describes the impact such innovations have on synagogue members, citing interviews with worshipers whose enthusiasm jumps off the page: “The Judaism I live is about choosing life,” one says. His book will likely inspire more American Jews to make that same choice.